Manage loss prevention and associate staffing based on peak traffic hours to help ensure adequate coverage in high traffic, high risk areas within the store. When Traffic Intelligence is linked to Loss Prevention data, retailers can reduce false alarms by screening out alarms on inbound vs. outbound traffic, as well as intercept "booster" and "jammer" devices as they enter the store. 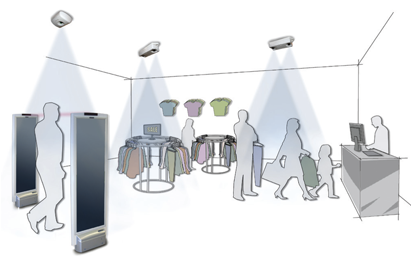 Sensors used in Traffic Intelligence solutions convert optical inputs into data streams that reflect the presence of shoppers. Multi-Sensor Portfolio: from embedded to overhead monocular and stereo devices. "With our new traffic intelligence solution, we are able to obtain the most essential traffic count data for conducting valuable analysis such as conversion rate, effectiveness of marketing campaigns and even act as a solid support for rent negotiation with our landlords."